Extreame Savings Item! Save 45% on the Fagor 2-Piece Induction Set with Magnetic 1800 Watt Cooktop and 9.5'' induction ready PFOA Free Non-Stick Aluminum Skillet - 670041860 by Fagor at Baking Love. MPN: 670041860. Hurry! Limited time offer. Offer valid only while supplies last. The Fagor 2X Induction Set includes a sleek electric countertop induction burner and a 9.5'' induction ready PFOA Free non-stick aluminum skillet. The Fagor 2X Induction Set includes a sleek electric countertop induction burner and a 9.5" induction ready PFOA Free non-stick aluminum skillet. This portable induction set is an 8 temperature/power level unit that uses 1800 watts of power and is perfect as an extra cooking zone in kitchens, campers, dorm rooms or as a buffet warmer for entertaining! Induction cooking provides a fast, safe and effective cooking experience using 90% of energy produced and is up to 50% faster than gas and electric saving you both energy and money. Any induction ready piece of cookware can be used on this induction unit in addition to the skillet that comes with the set. Uses regular 110-120 V.
New Features Include: The cooktop comes equipped with 8 power levels. Each power level has a corresponding Fahrenheit and Celsius temperature. Increased temperature range up to 465°F with 1800 watts of power! Most Efficient Way to Cook: The 2X utilizes 90% of the energy produced compared to 50% used by other cooking methods. The cooktop recognizes the base of the cookware and directly heats only the diameter of the pot, saving you energy and money. 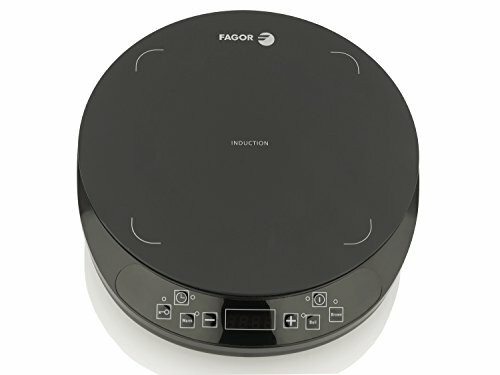 Fagor is the pioneer and leader in induction technology. The first Fagor induction cooktops were sold in the USA over 20 years ago. Induction is the Fastest, Safest and most versatile cooking surface. It cooks 50% faster than gas and electric cooktops, saving time, energy and money. This Fagor portable induction cooktop features 1800-watts of power, being the most powerful a portable induction unit can have. Only built-in induction cooktops can provide higher wattage. Safety features, such as an automatic safety shut off and a child safety lock make our units reliable and safe to use. If you have any questions about this product by Fagor, contact us by completing and submitting the form below. If you are looking for a specif part number, please include it with your message.